Gas Exchange – A vital life-sustaining process where we inhale oxygen (O2) and exhale carbon dioxide (CO2) [1, 2]. As each and every cell in the body needs O2 to live, humans cannot go without it for more than a few minutes ; so, the respiratory system is active all the time. Helping Maintain Homeostasis (Blood pH Balance) – After the gas exchange, as oxygen is carried to all the cells in the body, they absorb it and produce carbon dioxide as a result of the cellular functioning, which is then carried back to the lungs to be excreted. High levels of CO2 in the blood decreases the pH level (increases the acidity) of the blood, so getting rid of it helps maintain the acid-base balance . Speech Production – Inhalation is the first step of speech production, with the next two steps being sound production through the vocal folds around the larynx (phonation), and forming the words or sounds with the vocal folds, mouth, nose, tongue, and jaw (articulation) . The nose, specifically the nostrils, are the primary entry- as well as exit-points into the respiratory tract . After entering through the nostrils, the oxygen-rich air flows through the nasal cavity, a hollow space lying just behind the nostrils, where it gets moisturized and purified, freed of dust and other particles. The cleaning work is performed by the mucous membrane and cilia (tiny hair-like structures) lining the inner walls of the nasal cavity that traps any impurities and sweeps them out of the body through the nostrils [5, 6]. During exhalation, the nasal cavity collects and retains the moisture from the air that is leaving the body . During breathing, the mouth acts as the secondary entrance for air to get into the respiratory tract. So, in case of a blocked nose, or some other similar problem where the air cannot pass through the nasal cavity, the mouth helps with inhalation and exhalation. However, it lacks the mucous membrane and cilia, and so cannot moisturize the air like the nasal cavity [7, 8]. The small tubular structure located right behind the nasal cavity, the pharynx works by letting the inhaled air pass into the next part of the respiratory tract, the larynx . It has a simple, yet important purpose in respiration, to let the inhaled air pass into the trachea, and the exhaled air out toward the pharynx and nasal cavity . There is a thin flap, called epiglottis, at the superior end of the larynx that closes it off during swallowing so food cannot enter the airways and choke you . The trachea or windpipe is the longest part of the airway , starting from the lower end of the larynx, it divides into the two main bronchi near the lungs. It lets the air travel to and from the lungs, through the other parts of the respiratory tract . There are mucus-secreting goblet cells located in the inner lining of the airways, purifying the air on its way in . Tracheal Cartilage: There are around 20 cartilage rings surrounding the tracheal pipe, attached to each other with smooth muscles and connective tissues that help the trachea to remain flexible, and maintain its shape during breathing [14, 15]. 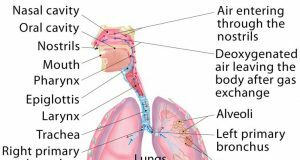 The part of the respiratory tract entering the lungs, the right primary bronchus is responsible for making the air enter the right lung, while the left primary bronchus lets air pass to and from the left lung . Smooth Muscles: Both the tracheal and bronchial walls contain smooth muscles, a type of involuntary muscle that helps regulate the airflow through the airways . When more air is needed, the cartilage rings and smooth muscles make sure the trachea and bronchi can expand well to accommodate the increased flow of air. Once the bronchi enter the lungs, they divide into multiple smaller branches or bronchioles that are responsible for carrying the inhaled air into the alveoli, the final part of the respiratory tract . There is a cluster of tiny air-filled sacs at the tip of each bronchiole (terminal bronchiole) known as alveoli. This is the part of the respiratory system that carries out the gas exchange process . There is a network of blood capillaries surrounding each alveolus. Once the air reaches the alveoli, their one cell thick membrane makes it possible for the oxygen in it to move into the blood capillaries . Pulmonary Surfactant: Mainly consisting of phospholipids, pulmonary surfactant is responsible for reducing the surface tension within the alveoli to prevent them, and the lungs in turn, from collapsing when the air rushes out during expiration [21, 22]. Both the left and right lungs are responsible for keeping the air flowing in and out of the body, so there is a continuous supply of oxygen to the blood. The alveoli are the main functional units of the lungs, that also helps maintain the pH balance of the blood by monitoring (along with the brain) the amount of carbon dioxide in the body , and filtering any gas bubbles from the bloodstream  that might otherwise lead to an embolism . Lung Lobes: The right lung is divided into three lobes, while the left lung has two. Each of these five lobes has the same function, dealing with the deoxygenated blood coming from all over the body . The Thoracic Cavity: The thoracic or chest cavity, surrounded by 12 pairs of ribs, the vertebral column, and the breastbone or sternum houses the lungs and heart . Pleural Membranes and Pleural Cavity: The lungs are surrounded by the visceral pleura (outer lung wall membrane) and the costal pleura (inner lung wall membrane), with the space between these two (pleural cavity) being filled with a lubricating fluid secreted by the pleural membranes . This fluid keeps the membranes from sticking to each other, thus helping the lungs to maintain their flexibility . The primary muscle of respiration, the diaphragm is located just beneath the lungs, partially inserted into the lower ribs . Apart from keeping the chest cavity separated from the abdominal cavity, the dome-shaped sheet muscle plays a vital role during inhalation by contracting and flattening at the base of the chest cavity, pulling the ribcage along with it to create a vacuum for the air to rush into the lungs . Once the gas exchange is done, the diaphragm relaxes, coming back to its original dome shape which puts pressure on the ribcage and the lungs, forcing the carbon dioxide-filled air to gush out through the airways . The 22 pairs of small muscles located between the ribs , the intercostal muscles help monitor the movement of the ribcage during breathing . These two systems work together to maintain homeostasis of the blood pH levels. Oxygen-depleted blood from all over the body is carried by the inferior and superior vena cava to the right atrium, which then flows into the right ventricle to be carried to the lungs through the pulmonary artery . As mentioned earlier, the alveoli, the site where the gas exchange actually occurs, are surrounded by a fine net of capillaries, supplied by the pulmonary artery. So, the blood that reaches the pulmonary capillaries has a high partial pressure of carbon dioxide. On the other hand, the air that reaches the alveoli from the airways has a high partial pressure of oxygen . So, the process of diffusion begins between the thin alveolar membrane and the capillaries, where both oxygen and carbon dioxide rushes from the high-density area to the low-density area, till the former has the higher partial pressure within the blood . This whole process is called external respiration. Afterwards, the now-oxygenated blood is sent to the left atrium, then the left ventricle, from where it is carried to different parts of the body by the arteries for internal respiration (gas exchange within blood vessels and the cells of the body) [7, 36]. Humans cannot control the movement of their lungs as there are no skeletal muscles (muscles that one can move voluntarily) directly attached to the respiratory system. So, the diaphragm and the intercostal muscles are the only ones that help pump the lungs [37, 38]. As the diaphragm contracts, the intercostal muscles shrink to move the ribcage higher, also making it go wider to increase the space within the chest cavity [39, 40] for air to enter. Similarly, during exhalation, the intercostal muscles relax so the ribcage comes back to its normal position, and along with the diaphragm coming back to its resting position, the space within the lungs become much narrower, so the deoxygenated air needs to be excreted . Medulla oblongata, the lowest part of the brain stem, is responsible for monitoring respiration . It assesses the levels of oxygen and carbon dioxide in the bloodstream to determine what changes are necessary for the blood gas levels. Then, it sends the required signals to the diaphragm and the heart so they can slow down or pick up the pace of their functioning . The two sides of the diaphragm are innervated primarily by the two phrenic nerves  while the intercostal nerves arising from the T1-T11 thoracic nerves supply the intercostal muscles . So, through these nerves, the brain regulates the involuntary muscle movement as well as the rate of respiration [38, 46]. This can also explain why you yawn. Sometimes, when you are too tired or sleepy, your lungs are unable to take in as much oxygen as the body needs. Once the brain senses the need for more oxygen, it sends an impulse to make you yawn . The nervous and respiratory systems also work together to help the sense of smell, with the olfactory bulb being supported by the cribriform plate of ethmoid bone, while the olfactory nerve branches pass through the ethmoidal foramen . 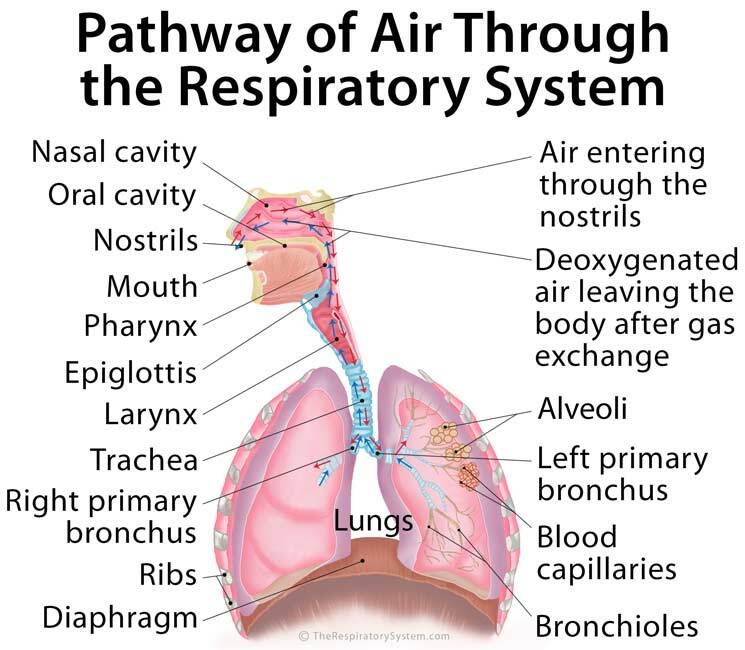 The respiratory system consists of multiple bones and cartilaginous structures which all help to protect the soft tissues of the respiratory organs . The perpendicular plate of ethmoid forms the wall that separates the nasal cavity into two sections while the maxilla, palatine bone, nasal bones, and concha all help to form the insides of the nasal cavity and help the inhaled air move in the right direction. The ribcage works with the respiratory muscles to let the lungs inflate and deflate freely, while also protecting the delicate organs from any damage or blow . The tracheal cartilages are also part of the skeletal system. The digestive system provides necessary nutrients to keep the cells and tissues of the respiratory system alive, which in turn supplies oxygen to each and every cell of the digestive tract so they can function properly . The digestive, circulatory, and respiratory systems all work together, with the digestive system keeping the other two healthy by sending enough nutrients, so the lungs can continue to exchange oxygen for carbon dioxide and the blood vessels can carry this oxygen to the whole body, including the digestive tract. 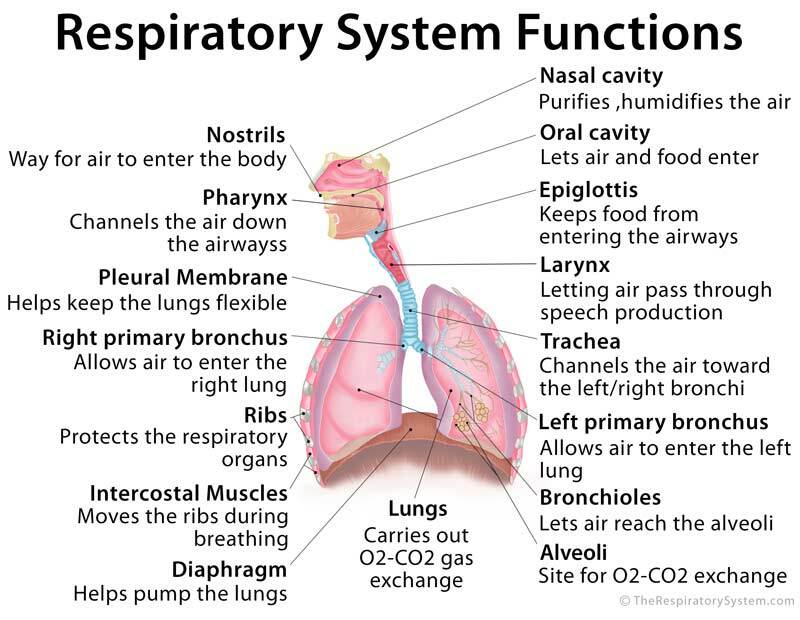 Apart from these, the respiratory system works with all the other body systems and organs directly or indirectly. Like the urinary system indirectly helps the respiratory tract and the lungs function by taking care of the waste matters from the digestive system. When the digestive system works fluently, it supplies enough nutrients to the respiratory system to keep it healthy .